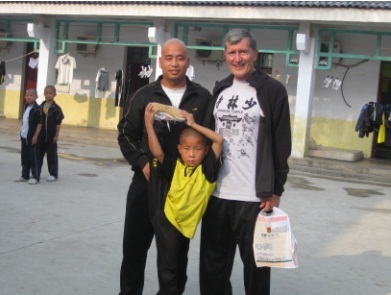 On this, which was my fourth trip to China, I had one new and specific goal and that was to make a martial arts pilgrimage to the Shaolin Temple to see for myself where it all began. You can read all about it on the Internet or in books, however, there is no substitute for personal experience. I have over 40 years experience in the martial arts and have trained with some of the best masters in the world. I continue to enjoy the styles of Gong Fu I already practice but I have an open mind as to what I might not have seen or learned. 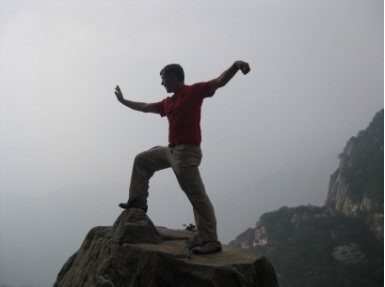 Some say the Shaolin Temple is utterly amazing and the only true place to study Gong Fu. Others say it is a tourist trap with unqualified teachers all too ready to take your money and then teach you something of little real value. I was expecting something in-between these two views, and I just had to see for myself! I will try to provide information in the article that will enable you to take this unique trip yourself if your spirit of adventure compels you. Let me warn you though, traveling in China can be difficult and confusing but it is not impossible. I have a little advantage though because I can speak some Chinese and of course, this is very helpful. (TIP: For the bare essentials see the Understandin’ article: Top Ten Chinese (Mandarin) Phrases) However, even without Chinese language ability, you can take the trip and I assure you…it will be the adventure of a lifetime in more ways than one! My journey to the Shaolin Temple from Beijing began with the purchase of my train ticket to Zhengzhou city, which is the provincial capital of Henan Province. There were two trains available from the Beijing West Railroad Station: one in the morning and one in the evening. There is actually a ticket window where English is spoken and this is the shortest line for tickets because practically no one speaks English! Be careful because there are several railroad stations in Beijing offering transportation to various parts of China. I decided to take the evening train 10:48 PM. Enjoying amenities, I opted for the sleeper car so I did not have to pay for a hotel that evening and when I awoke at about 6 AM, I would have already arrived in Zhengzhou. This sleeper car costs $264 Yuan or about $ 39 US dollars. Each sleeping compartment accommodates four people and you want to make sure you buy the ticket for one of the two bottom beds since there is a lot more room on the bottom than on the upper berths. The mattress is super firm almost like the cushion on a hard couch but it is not uncomfortable. Also a word of advice if you have never been to China: Always carry your own toilet tissue and be prepared for the type of toilets that are common in China and also on the train; that is, a hole in the floor…no toilet bowl. The hard economy class seat on the train is much cheaper but I was trying to rest and save my energy for the Temple. I did not know what training and adventure would be in store for me. Zhengzhou City is very close to the smaller city of Dengfeng, which is located near the Shaolin Temple. Located at the foot of Taishi Mountain, Dengfeng would be my home base since the temple is only 15 minutes by bus or taxi. There are many hotels in Dengfeng and one just needs to consult with a tour book for a recommendation on accommodations. I personally like the Lonely Planet Tour guidebook because in addition to the English, it includes the Chinese characters for the names of places, which are essential to show a cab driver where you want to go. My first impression of the Shaolin temple was that it is more magnificent, beautiful and larger than I had imagined! 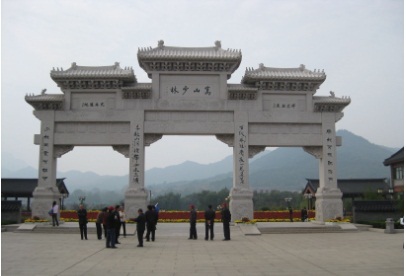 There is a huge statue with hands in the traditional Shaolin salutation, which greets visitors as they file through the three spectacular arches of the entrance gate. The first building that one sees on the right after entering the Temple grounds is the famous Shaolin Monastery Wushu Institute at Tagou. This Institute is one of China’s largest Traditional Shaolin Kung Fu academies. Tagou is famous for its rigorous training and its students receive top-level training in open hand and weaponry. This Academy has trained some of China’s top martial arts experts and teachers. The admittance office is located through the open courtyard on the right, up a small hill. One needs to go to the second floor of the building to find the office. I was told that they accept students of all levels and are flexible to accommodate one’s schedule. Fortunately the Special Manager of Foreign Affairs there that day was a friendly young girl who speaks perfect English. Needless to say what I saw was amazing! Thousands of students practicing at a time. Yes, literally thousands! Martial artists were everywhere! In the open fields, in the courtyards, in the Academy’s training halls and just about any other place you looked! Coaches were teaching students of all ages. Children who look just old enough to walk were tumbling, training forms and displaying remarkable flexibility. 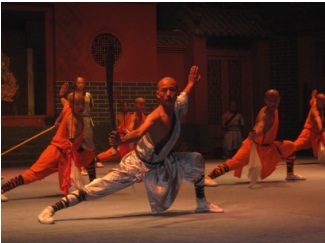 Martial artist were adroitly practicing weapons of all varieties with amazing precision. 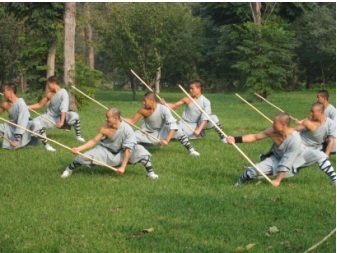 The Shaolin Monastery Wushu Institute at Tagou’s website is www.shaolinkungfu.edu.cn. Henan Province is known as the “Cradle of Chinese Martial Arts” and it is easy to see why this academy is one of the most famous. The Temple also has a large indoor theater, which regularly has orchestrated Gong Fu performance done in front of a Shaolin Temple backdrop. The demonstration is fast paced with a broad display of open-hand and weapon combat. It is a must see. There are also many outdoor demonstrations, which take place at the main front gate where spectators can enjoy amazing displays of Gong Fu and Qi Gong. In addition to the martial arts, the temple grounds have many famous attractions. First and the most famous of them all is known as the Gateway and is the chief entrance for the Permanent Residence Compound. It is made up of the front gate and two side gates; this Gateway is the building used as the backdrop for Gong-Fu movies and is the most recognizable structure when one pictures the Shaolin Temple. It is the red building that bears the inscription of the three Chinese characters for the “Shao Lin Temple” in gold characters on a black background. The carved dragons on the glazed tile roof embellish the spirit within. Seeing and entering this structure alone made my whole trip worthwhile. Entering the gateway was like a trip into the past, feeling the energy and essence of those who trained there, died, and were buried in the nearby Pagoda Forest Cemetery. In front of the Gateway is an immense yard with two inscribed stone archways. The Pagoda Forest is actually a cemetery and is located on a hill, just a short distance from the Permanent Residence Compound. It consists of unique stone pagodas of various heights and styles, and they are silhouetted against the tall trees in the forest hence the name Pagoda Forest. The bodies of many famous monks are buried here and the feeling one gets while walking there is indescribable. It is spectacular, serene and breathtaking. Bodhidharma’s (Damo) Cave is located about 4000-meter hike from the Pagoda Forest. Legend has it that, Bodhidharma sat meditating so long that his shadow is embedded on the wall of the cave. In addition to these attractions there are other interesting buildings, halls and Chapels too numerous to mention in this article. The Shaolin Temple is an amazing attraction for tourists as well as for those who make religious pilgrimages. When your adventure comes to an end simply reverse your commute to return to Beijing as I did or continue on to another destination in China. You will be returning home with an unforgettable adventure under your belt! As a martial artist you will perhaps feel as I did: that you actually are now a part of a rich and compelling history and that you have experienced firsthand life at the Shaolin Temple! Good luck and as the Chinese say, Yi Lu Ping An….. Have a safe trip! Speaking Chinese in China is not required, but good to know some basic words and phrases. When traveling by train in a sleeper car, purchase the bottom bunk(s) as they have more room. Bring toilet paper and be prepared for Chinese toilets (only a hole in the floor). When visiting the ShaolinTemple, stay in Dengfeng which is only 15 minutes away by taxi or bus. Use the Lonely Planet Tour guidebook because at has English as well as the Chinese characters which you can then point out to people for destinations and items. 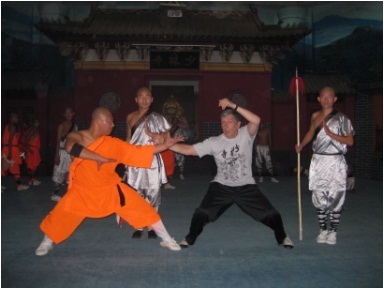 The Shaolin Monastery Wushu Institute at Tagou is the most famous and prestigious of the Gong Fu academies in the area. 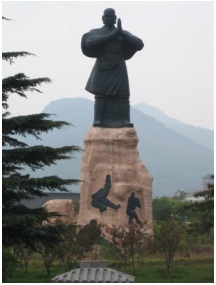 For the full article and more on the Shaolin Temple, please Click Here.